Good evening. 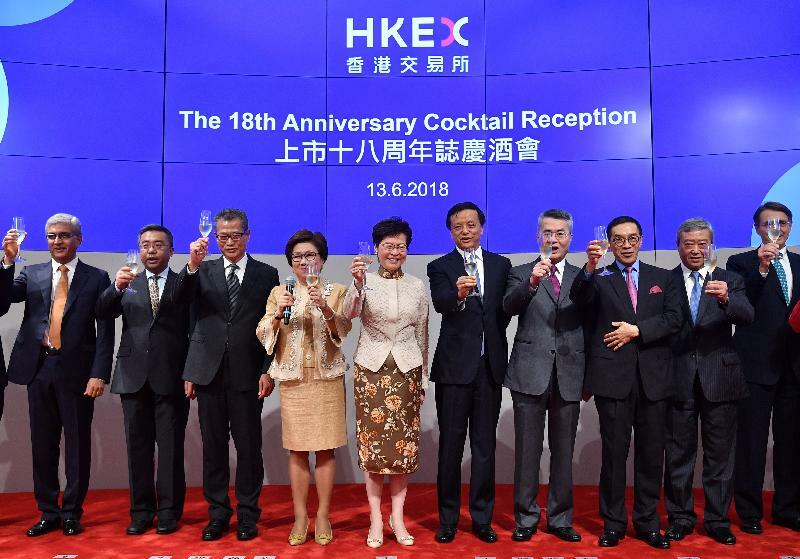 It is a great pleasure to be here to join you all to celebrate the 18th anniversary of the Hong Kong Exchanges and Clearing Limited, and I am particularly grateful to Laura for advancing the date of this reception to suit my schedule. I have to tell you it is very rare for the Chief Executive to ask the organiser to change a date in order to suit the Chief Executive, because I have enough - more than enough - invitations to a lot of things. But I really want to come this year to share the joy of the celebration because this evening's reception is not just what Laura described as a momentous occasion for HKEX, but actually it's a historic moment for the first lady Chief Executive of the Hong Kong Special Administrative Region and the first lady Chairman of HKEX to take the stage and to give you that confidence that Hong Kong's financial services will grow stronger and stronger under two women. Of course I have every confidence that under Laura's leadership, with her sparkling track record and building on the strong foundations of HKEX laid by Charles Lee, Ron Arculli and C K Chow, we will be seeing a very promising future for Hong Kong's securities market. Today is the 18th anniversary and this number 18, I'm sure you'll agree, is a very good figure. 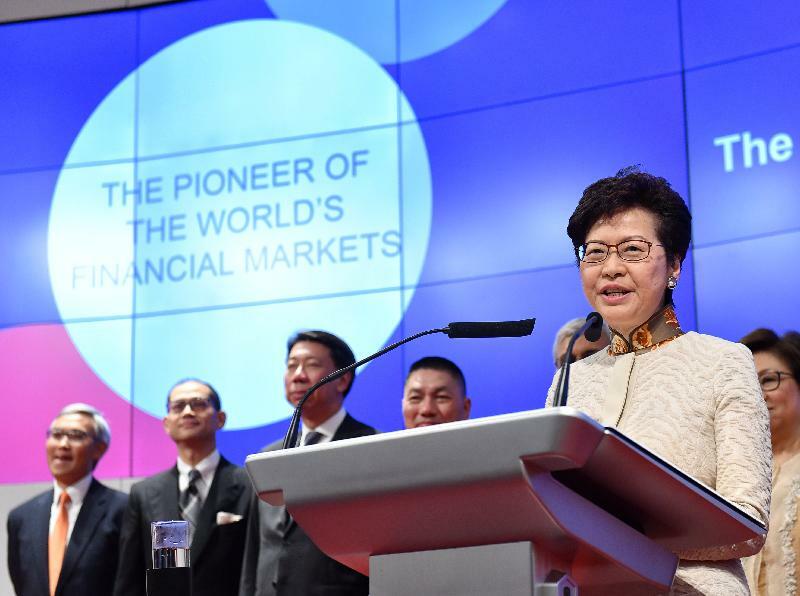 It will bring good fortune to Hong Kong and to the future of HKEX and the market. Also 18 is a moment you enter adulthood. I'm not suggesting that HKEX was kind of childish in the last 17 years, but this is a moment for us to enter a new era of adulthood. So, if in the past we have benefited significantly from the opening up and reform of the Mainland of China's financial markets, this is a time for Hong Kong to go global. A few days after I took office, I was standing here to witness the launching of the Bond Connect, and we have to be extremely grateful to the Central Authorities for giving us so many opportunities in the last few years, one after another with the Shanghai Connect, the mutual recognition of funds, the Shenzhen Connect and then last year's Bond Connect. But Hong Kong's value lies in being international, and this is where we could contribute to the further opening up of the Mainland's financial markets. So I have this joint mission and aspiration with Laura that we should really take our markets globally and attract more internationally renowned companies to come to list on HKEX. I already put in my little part by going on a 12-hour trip to Saudi Arabia last December, Riyadh, for only one single objective - you know what that is, and we're still working very hard at that. I'm happy to go on more roadshows, if my diary permits, with the HKEX in order to tell the world that this is the place to be, because attracting overseas companies to list in Hong Kong is not just a question of listing rules - although listing rules are very important as we have seen from the new listing rules to attract new-economy technology companies, biotechnology companies and secondary listing of overseas-listed companies in Hong Kong. But it is not just the listing rules. I would say that it is not just the regulatory regime of Carlson (Chairman of the Securities and Futures Commission (SFC), Mr Carlson Tong) and Ashley (Chief Executive Officer of the SFC, Mr Ashley Alder). It is also what Hong Kong can offer. So, it is for me as the Chief Executive, the Financial Secretary and our team to back up your promotion work to tell people what this city can offer. We can offer the rule of law, the independence of the judiciary, this high degree of internationalisation and this place being a very liveable city so that more companies from abroad will choose Hong Kong as their destination for the raising of capital. I hope that in my tenure I will continue to make my contribution to Hong Kong's securities industry, and I hope that you will all support Laura and the team and my Government in bringing Hong Kong's securities market to new heights.